To donate to Madeline’s bail click the donate UNDER the thermometer on the left! Madeline aka “Miss Dee Meanor” has a long history of partners and aliases! She was once part of the popular fitness duo, Heidi and Deidi, best known for their claims of being sisters of Hans and Franz and cousins of Arnold Shwarzennegger. They convinced thousands to become members of their cult claiming that cellulite is actually rippling muscles! 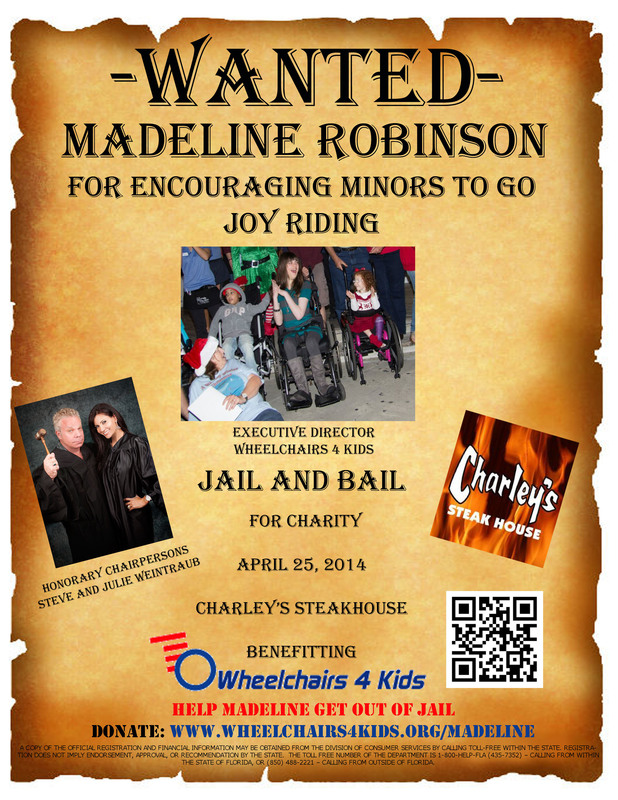 Madeline is notorious for soliciting funds to help kids with physical disabilities. Her crimes have led to children being able to escape the confines of their homes and gain access to places and experiences not previously enjoyed. Madeline is the founder and Executive Director of Wheelchairs 4 Kids. 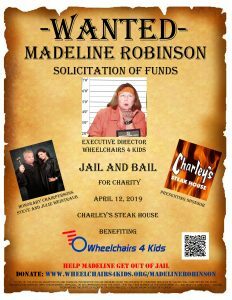 Please make a donation today to help Madeline get out of jail. Ask your friends to donate too. Every donation will make a difference in a special child’s life!